In the late nineteenth century, back when he was alive and well and enjoying worldwide fame as the self-proclaimed sovereign of all the United States, his Imperial Majesty Emperor Norton I did not (as far as I know) live in Bernal Heights. Nevertheless, Bernal has today become the nexus for a devoted cadre of Emperor Norton aficionados. And who could forget that in 2013, La Lengua rebel propagandist Burrito Justice helped orchestrate a spirited (if unsuccessful) effort to name the Bay Bridge in honor of Emperor Norton. 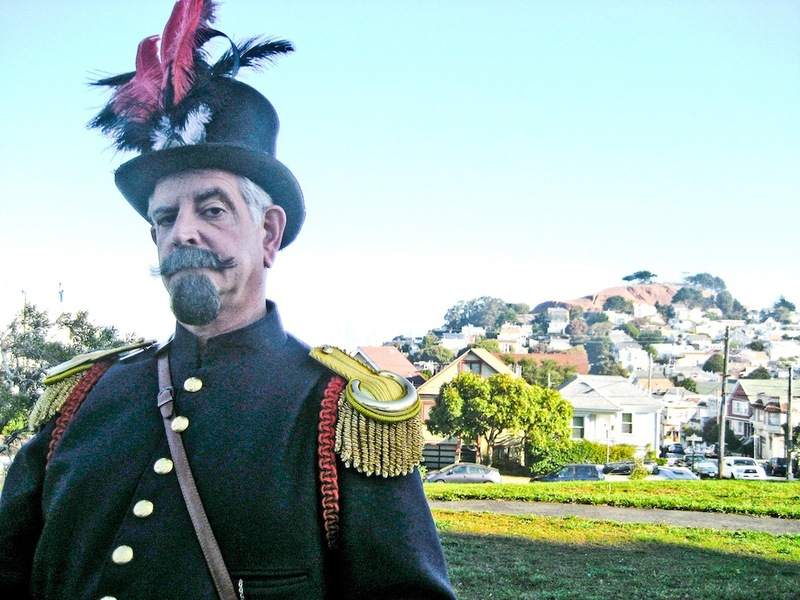 Now, to complete Bernal’s trifecta of Nortonphilia, Neighbors Jesse Chandler and Kat Shreve have just launched an effort to create a proper, feature-length documentary about Emperor Norton. Jesse and I are proud Bernal residents! We reside at Cortland and Prospect (in Cortlandia). We’re writing you today to announce the launch of our Kickstarter campaign to fund a feature-length documentary about Emperor Norton. The Kickstarter funding will pay for editing, research, illustration, animation, audio mixing, and a musical score to help re-create the world of 1860s San Francisco. We’ve gathered the talent to create an amazing film about the Emperor but now we need your help to tell the story properly. Thank you for taking the time to check out the project! Of course, all this Bernal-based Nortonmania doesn’t really require much explanation. From the vantage point of 2014, it would seem that the original Emperor Norton was a very Bernal sort of oddball — whether or not he ever spent much time here. And besides, a proper documentary on Emperor Norton is long overdue, so we raise our imperial champagne flutes to Neighbors Jessie and Kat for making it happen. So far so good — Neighbors Jessie and Kat are off to a great start. Don’t forget; you can donate to the Kickstarter here. I saw Emperor Norton on the 14 Mission Saturday morning, but it wasn’t that guy in your photo, it was someone who looked more like the original picture. It was very amusing how everyone else on the bus totally ignored him. It probably *was* that guy. The photo here is from two or three years ago. And “the Emperor,” Joseph Amster, since has grown out his hair, let his beard and burnsides go a little wild, and let his hair go gray. I also thought it should be noted that one of the owning partners of Emperor Norton’s Boozeland, (and also Bender’s Bar & Grill), is born and raised in Bernal Heights. So have yourself a nice cold drink, and toast one to the Emperor! It’s funny that we revere eccentrics of another era and wax nostalgic about Prohibition, and yet we can’t wrap our brains around modern-day eccentrics like Omer the doorway guitar player, or Bambi Lake, chanteuse. Or for that matter, the most interesting eccentric of all (and the brightest), Chicken John. You love eccentrics of another century, but you didn’t vote for him for mayor in THIS century, and yet he has come up with more fascinating ideas that work than Ed Lee could ever muster up with a legion of assistants and advisors. And today we don’t tolerate drug dealers in our midst, but think nothing of the gun violence that beset Prohibition. In fact we want to read all we can about that stuff. We liked illegal booze running in the 1920s, but don’t want a marijuana store to open down the street from us. NORTON: History has portrayed Norton I as a kindly eccentric, but in reality he was a Capitalist of the first order. Knowing that the large numbers of Chinese people in SF ate rice as a staple, he did everything he could to buy every shipment of rice coming into SF in order to gouge the Chinese. The last laugh was on him because he failed to buy up ALL the rice, as the Chinese got wise to him and banded together and chartered their own ships to bring in their own rice. It wiped out Norton financially, and after leaving town for awhile, he came back and plied his “eccentric” behavior all over town. Not a bad gig. He managed to get people to buy him his meals, got free rent from a benefactor and even got the SF Board of Supervisors to buy him a new uniform every year. Norton the icon is cute; Norton the man was the J.D. Rockefeller of rice. Oh, sure, 30,000 people showed up for his funeral, but I doubt that many of them were Chinese. Well, I’d argue that Frank Chu is our closest Norton equivalent today, and he seems to be widely appreciated. Also, if you do more research on Emperor Norton, you’ll discover that he single-handedly stopped a race riot in Chinatown. He spent much time with the Chinese in Chinatown and often saw a doctor for medicine there. At the end of the day, Norton the First: America’s Emperor is a documentary about Norton, yes, but also about how San Francisco was and is shaped by eccentrics. That this city has always managed to embrace those who are different. By the way, Omer was shown in the Kickstarter video. Along with Bushman, Pinkman, Frank Chu, and Marian and Vivian Brown. Norton is so fascinating because despite his madness, he was eloquent, charismatic, a visionary, and unabashedly himself – delusions and all.